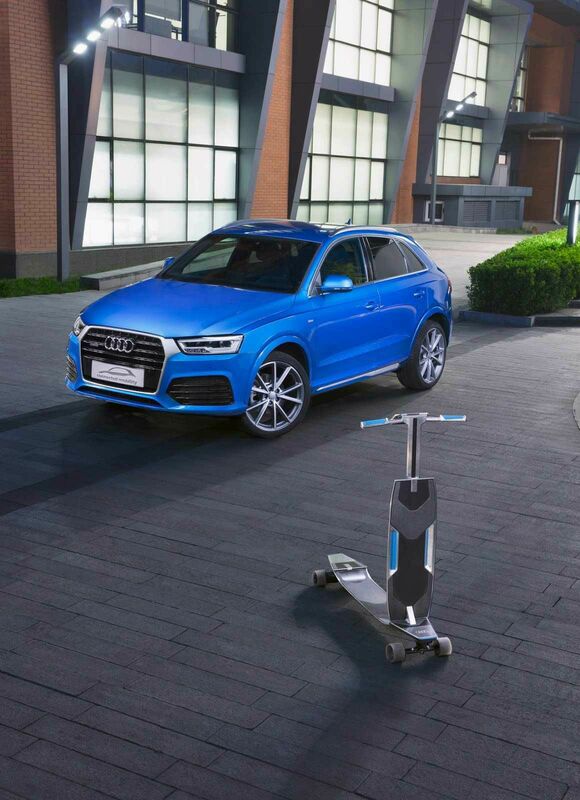 Audi Q3 With Inbuilt Multipurpose Scooter Has Got You Covered. Audi is not only set on bringing full satisfaction to their customers but also seems to spoil them with lots of techs that will keep them coming back for more. It's very obvious that nobody likes to be stuck in a traffic jam, even if you are the meekest of men. which is why Audi decided to modify the Q3 and integrate an electrically powered longboard into its rear bumper. Cleverly hidden away, the carbon fiber and aluminum-made device will charge automatically, but for an optimum experience, Audi recommends connecting your smartphone to the crossover's infotainment system, linking the calendar, as the tech will calculate the fastest route possible, using real-time traffic. Operates with the phone clipped to the unfolded handlebar to display directions and speed adjusted with a remote control attached to the right handlebar grip. Operates with the handlebar folded down, allowing the rider to control the speed via remote control in his/her hand. For any light-duty hauling, the board can also be put into cargo mode. When it is activated, it can follow the owner around autonomously when paired with a smartphone or smart-watch. 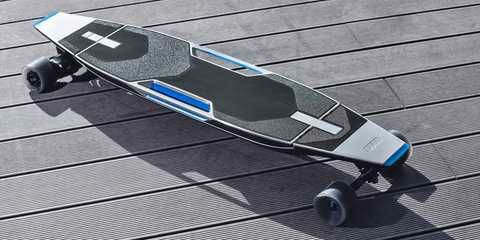 The board could serve as a transport device for shopping bags or luggage, following its owner connected wirelessly. I can see some women smiling already. 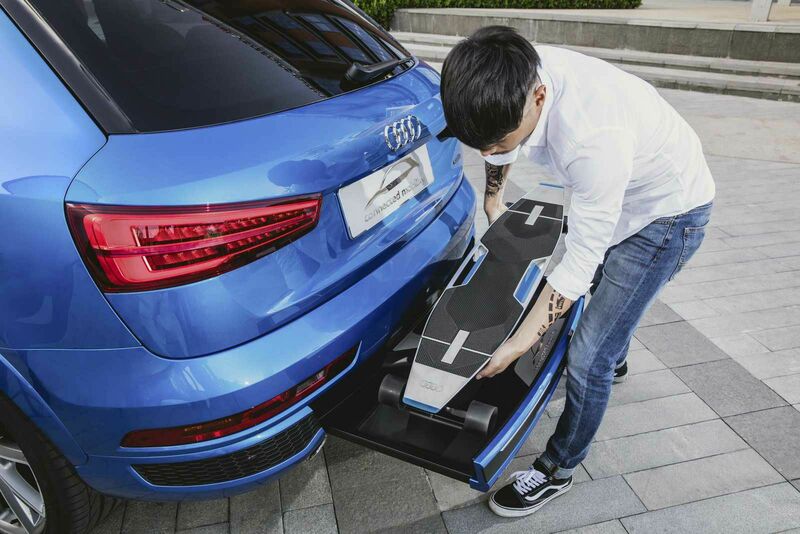 What do you think about Audi's latest tech? Let us know in the comment section below. Nigerians and Their Uneven Love for Toyota. Growing up in a small southwest city, I was exposed to a variety of cars Toyota corolla, Starlet and the Carina, the Peugeot 404, 504 and 505 evolution, the Volkswagen Golf Mk 2 which my mom used, the Passat and the Jetta, Nissan Laurel and Bluebird, the Mercedes Benz 230E, "baby Benz" 190E, the frog faced 1999 E-class and the C class. I also remember some SUVs like the 4 runner, Land Cruiser and Toyota Prado that was used by the present Ondo state governor when he was still a commissioner for health and lastly, that car we used to touch and run after triggering the loud anti-theft alarm, the car which after acquiring, the owner would automatically be made a chief in Igbo land, the same one which had small wipers on its headlights, the luxury Mercedes Benz S class that was only used by wealthy people, the same wealthy folks who had broken pieces of glass cemented on their on their fences. Back in the day, there was an endless list of cars to feed my eyes on. Fast forward to post 2010 and all I see in the southwest is Toyota more Toyota products then maybe some Honda, I get to see some of the other brands but not as much as the Toyotas. Needless to say, I am bored and I have only the internet to help fuel my automotive passion until I took a trip to the North. The diversity was more than I ever imagined, you get to see all brands of cars from the Italian Alfa Romeo to the German Beamers and Mercedes Benz, Peugeots, Chryslers, Cadillacs, Chevrolets, Fords, Ferraris, Lamborghinis, Bugatti Veyrons and all of the exotic cars you only see on TV. One gets very excited with the presence of these cars making their noises around, gallivanting and disturbing the peace. OK, I confess, there is a high chance that I might have included some form of exaggeration in what I've written above. A city like Lagos in the southwest is somewhat different. Though we still have a multitude of Toyota loyalists who would reject a Mercedes Benz G63 AMG for a 2008 Toyota Camry without second thoughts. There are quite a number of brands available for the healthy consumption of the human eyes. Same applies to places like Warri and Port-Harcourt, our rich lands of black palm oil, I have my resident friends constantly telling me of stories of families who have endless fleets of Rolls Royce Mercedes and Bentleys but the undisputed fact remains, the Toyotas and Hondas are in so much abundant abundance. I agree, there are Toyotas everywhere in Nigeria, heck! everywhere in the world but the big question coming from all edges of the universe still remains, why is there such an imbalance of this distribution in southern Nigeria? For more amazing articles, download CARVOLUTION MAGAZINE here and enjoy the ultimate auto-mazing experience. "London needs and deserves its own motor show - now it's got one"
"It might not be as big as the New York motor show, but it will be of great benefit to Britain as a whole, says Mike Rutherford"
Mark Schienberg and Alec Mumford have never met and, at first glance, couldn’t be more different. The former is an American whose Manhattan office has the Hudson River on one side and the Empire State Building on the other. The latter is a Brit whose company HQ in London is HMS President – with the River Thames below and St Paul’s Cathedral above. 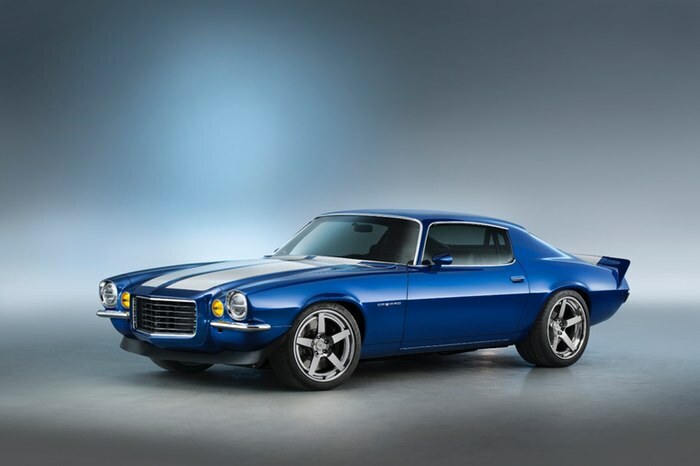 When Schienberg closed the doors at the New York International Auto Show a few days ago, he – as show president – began counting the cost of the best-attended car exhibition in North America. Approximately $300m is the positive economic impact the event brings to New York each year. Impressive eh? This isn’t lost on Mumford. He’s the man who’s been entrepreneurial and brave enough to ensure the London Motor Show is reborn and open to the public from 6-8 May. As chairman of the event, he’s aware that it won’t generate as much revenue as the New York show, but countless individuals and companies will still benefit hugely from the car exhibition in Britain’s capital next month. “Imagine a pyramid with the motor manufacturers and dealers at the top,” he said. He’s not wrong. There’s also the little matter of HM Treasury collecting 20 per cent VAT on the millions of pounds worth of cars being sold at the show. 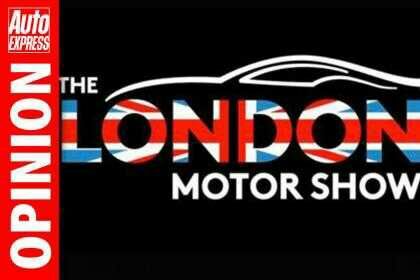 And with most of the tickets already snapped up by car enthusiasts in Britain and countless foreign lands, the event will undoubtedly serve as a great advertisement for London/Britain PLC. “It’s a showcase for manufacturers and dealers to reach out nationally and internationally and promote the message that the UK is a mainstream operator in technology, design, build and supply,” Mumford added. London is a top-five, truly international city, along with New York, Paris, Los Angeles and Tokyo. It needs and deserves its own motor show. And now – thanks to Mumford – it’s got one. Whether you’re a car-mad child or adult, passenger, driver, dealer or manufacturer, you’ve simply gotto go. I mean, who in their right mind wouldn’t? Here's why your car can easily get stolen. ADAC, the German Automobile Club, is sort of the AAA of Germany. Recently, the group revealed the findings of some auto security tests they'd run to bring attention to how easy it is for thieves to exploit keyless entry systems and steal cars, despite the fact that the vulnerability has been known for years. The technique involves cars equipped with keyless entry transmitter keys. 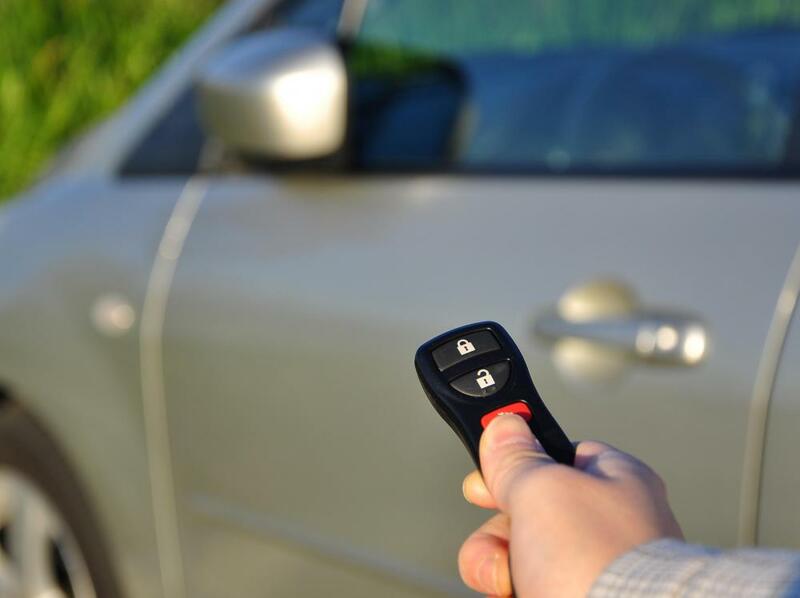 Normally the key, which uses a radio signal, must be just a few feet away from the vehicle. The ADAC researchers figured out that with some inexpensive equipment, they could pick up the radio signal from a nearby keyless entry fob and extend it several hundred feet. The equipment cost ADAC roughly $225. Once inside, the researchers (or thieves) would be able to start and drive the car away, as most automakers allow the engine to keep running and the car to drive even after the keyless entry fob goes out of range. ADAC used the technique on several cars in Europe, including Audis, BMWs, GM products, Fords, Kias, and Toyotas. This hacking technique isn't new, but the ADAC release shows that it's still a threat to contemporary cars. The only effective deterrent is to keep a keyless fob inside a signal-blocking device, like a bag or a Faraday cage, when the key isn't in use. Even your freezer may be an effective signal blocker, if you don't have a Faraday cage handy, according to The New York Times. So this is simply another demonstration that there's a simple, effective, inexpensive exploit that thieves can use to steal cars, and that automakers still haven't come up with an effective solutions. That's the point of ADAC's recent demonstration – and why we're reminding you that it's still a threat. Nigeria’s ultimate automobile and bike show, Grills2Grills, opened to the public last weekend with an exhibition of unique classic cars, super cars, muscle cars and motorbikes from private collectors and owners in the country, at the Main Bowl of Tafawa Balewa Square, Lagos. The event was attended by the Executive Governor of Lagos state, Akinwunmi Ambode, ably represented by his Special Adviser on Primary Healthcare, Dr Olufemi Onanuga. There were also some celebrities present including ace comedian Ali Baba and veteran rapper Ruggedman. Grills2Grills created an exciting environment where owners and collectors of rare and interesting automobiles and motorbikes showcased their cars and bikes for car enthusiasts and the general public. The two-day event was a fun one, with attendees expressing delight upon seeing the special cars and motorbikes on display while also taking pictures. Many attended with their friends and families in what was a memorable event. Some of the unique cars that were showcased at the event include MG Midget, Dodge Challenger, Lotus Elise, Ferrari 458, Mercedes 220 SE Coupe Convertible, Peugeot 404, Chevrolet Camaro, Nissan 350Z, Mercedes 500E, Mercedes Benz 380SL, Bentley Azure Mulliner and more. Motorbikes also on show include BMW K1300S, BMW K1600GTL, Yamaha FJR, Honda VTR and many more. Woman Who Killed Abuja Biker And Alleged Cover up By Nigeian Police. If you are a frequent visitor of Nairaland.com, you might have seen something like this earlier this week. This incident has been confirmed by a Biker contact of mine and I feel things should be handled according to the provisions of the law with the accused person(s) punished if found guilty. Nobody is above the law irrespective of his /her position in the society. Well here is the story ...and more. On Friday, 1st of April, 2016, along the Yoruba mosque axis of the Maitama district, a Biker, Mr. Somar Ain Al Shaibeh was on an afternoon ride, kitted with his helmet. Unknown to the rider, a woman driving a TOYOTA MATRIX CAR with Plate Number BW 227 RSH out of impatience was carelessly driving against traffic as to avoid the traffic gridlock caused by a mosque on her rightful lane, and decided to drive one-way through the very dangerous bend. Before the rider could sight the oncoming vehicle, it was too late and a head-on collision became unavoidable. He was hit by the woman, unconscious and was rushed to the hospital, and a case was lodged with the police. On Tuesday, April 5, 2016, brother Somar passed on. 1. The woman who caused the accident was neither arrested for wrong driving nor made to leave a statement with the police. She was allowed to leave for her home directly from the hospital where the rider was rushed to. 2. The whereabouts of the woman and her car is unknown as it was not taken to the police station. IPO claims they have orders to lodge accidents cars at the VIO, this is apparently not true as efforts to compel the officer to let the Abuja bikers team to sight the vehicle with the supposed VIO was resisted by the police. The bikers were threatened with arrest if they kept insisting on sighting the vehicle. They also do not have in possession her car papers as well as driver’s license. 3. Asides the woman’s phone number, the police have no other information about her, and all efforts to reach her on phone have been abortive as she refused to answer calls. 4. The car, a TOYOTA MATRIX with plate number BW 227 RSH is suspected to be carrying an illegal plate number. Investigations carried out by the Riders comunity revealed the woman's Identity as they discovered that her name is Victoria Christopher Umoren and she is a lawyer who works wth the National Boundary Commision. The Riders Community is appealing to well-meaning Nigerians and media outlets not to let this matter be covered up in any form as it indicates, something sinister is already happening. A young man's life has just been wasted. The Bikers are law abiding members of the society and are ready to release video evidences if the police insist on not taking appropriate action. There are testimoniea from eye witnesses at the scene of the accident and picture evidences of events that occurred throughout this period. If the police refuses to bring this woman to book, the biking community insist that they shall rise up to resist this with all legal means possible so as to ensure their free right to movement and association is not infringed upon. They passionately appeal to the public to join hands with them in this noble cause. They also wishes to let the general public to know that they shall call an international press conference within 48hours if the police refuse to do what is legitimate by producing the woman and prosecute the case. 1. Bikers are fun loving hard working Nigerians, you can’t own a bike if you are not hardworking and productive, the notion that bikers are irresponsible and jobless is false and inappropriate. 2. Last week the NTA tried to cook up a story that a reckless biker had caused an accident without prior investigation. However, on investigation, the story was found to be untrue. This is how we are daily treated by car users and the media. 3. We shall continue to enlighten the community that biking like every other sport has its own lovers and they should therefore be treated fairly. Power bikes are a means of transportation and users are covered within the ambits of the law to use it as so. 4. The biking community in Abuja and Nigeria wish to call the attention of all media houses, well-meaning Nigerians and the international community to the series of negative actions daily meted by car users and the FCT administration on Bikers living in Abuja. For more articles, download CARVOLUTION MAGAZINE here and have the ultimate auto-mazing experience. Break up with your partner if he or she is fat. If you have fat friends, make sure you are going out in their car not the other way around. With the increase in price of PMS, people have been wondering how to save fuel. Nigerians always see opportunity in every situation which means some people started importing stuff they say will reduce the rate at which you petrol burn by 25%. Petrol cannot be diesel. So here I am giving you tips on how to reduce your fuel consumption. If you are driving a Corolla, you really don't have to worry except you are not ready to use a car. If you drive cars like Infinity FX45, Benz S550 etc this post is not for you. You are meant to spend alot on fuel. So many Tips but I will shortlist a little that you can follow. 1. Drive at the speed limit. This is the single most effective solution to increasing efficiency. The most fuel-efficient speed may be the point at which your vehicle shifts to high gear. For most vehicles, this is somewhere around 80mph. 2. Try to avoid traffic on busy days or times when it is raining, windy or barometric pressure is high. Rain, headwind and high barometric pressure create extra air drag that uses more fuel to create and maintain forward motion (a tailwind helps). 3. Get rid of any unnecessary weight in your car or truck like golf clubs or unnecessary tools, materials and YOUR FAT GF. Lowering the tailgate on a pickup truck actually reduces your gas mileage by reducing drag. 4. Avoid wasting fuel from pressing the gas to regain the speed lost from braking when following closely (tailgating) which forces you to correct your following distance by applying your brakes, slowing forward motion. 5. Every time you punch the gas to quickly accelerate after stopping you are burning extra fuel and increasing tire wear. 6. It increases fuel consumption when you allow the vehicle speed to drift lower and then accelerate back up than it does to maintain a steady position on the accelerator. 7. Change your air filter. A dirty air filter will rob the engine of power and efficiency. It will use more gas than a clean filter. 8. Keep the tires inflated to the proper pressure to increase your travelling distance on a tank of gas. Keep a tire gauge handy and check the pressure. Tires naturally lose air over a period of time. 9. Service your car at manufacturers recommended intervals. Tokunbo or New. Changing spark plugs and co when their performance begins to drop. 10. Avoid excessive idling. If you idle your car for more than a minute, it will save gas to turn off the engine. 11. Ignite the engine. Wait for the rev cursor to return to 1. Then move slowly. Your car will warm up b4 you get to the main road or highway. NB: New cars don't need to be warmed up. 12. The Air conditioner consumes fuel. Use it only when its necessary. In the afternoon, in traffic or when it pours. 13. Keep track of your fuel economy so you can quickly identify when your vehicle is in need of a tune-up or other service. 14. Pretend that there is a raw egg between your foot and the accelerator pedal in your vehicle. You don’t want to break the egg and get the mess on your floor boards so you’ll be less inclined to mash down the throttle pedal. The idea is to encourage gentle accelerations and avoid flooring or lead footing your vehicle. 16. One great way to save fuel is to do minimal braking for turns. When coming up to a turn or bend, threshold brake at the limit of adhesion and slowly release the brakes as your turn the wheel. Once your come out of the turn you will still be near the speed limit. Never fill past the auto-stop on the pump – anything above that can spill and can be negated by emissions systems! Either way, topped-off fuel is wasted! 18. When you arrive home, take the time to reverse park into your garage/parking lot. Do this while the engine is already up to temperature instead of spending time in the morning reversing and manoeuvring the car out while the engine is cold and consuming more fuel. I use a simple GPS that I bought for only $99. Whenever I am unfamiliar with the route, I plug in the address to avoid getting lost and wasting miles. It also works great for finding food and fuel stops along the route of your trip. 20. Most effective way is to sell your car. We will help you do that at Minkail Autos Ltd. 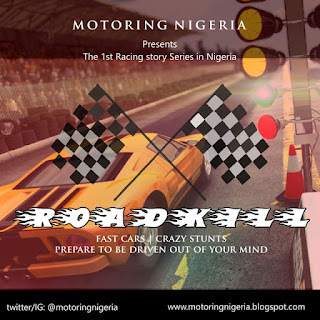 Here is witty and informative piece written by Minkail Adesoji, a seasoned car enthusiast and dealer. 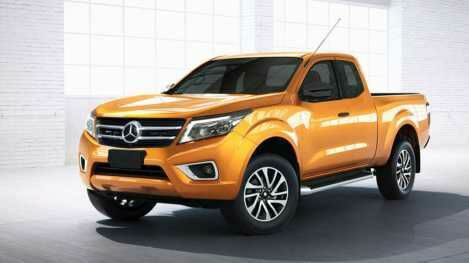 Will the Mercedes pickup truck be called X-Class? Mercedes-Benz will preview its upcoming pickup truck at the Paris motor show this fall, Auto Express reports. The pickup, which will likely be badged X-Class, is expected to go on sale in the fall of 2017 as a 2018 model. The newest addition to Stuttgart's light-truck lineup will share most of its mechanicals with the 2016 Nissan Navara pickup, though the powerplants are expected to be Mercedes' own. Expect four- and six-cylinder engines under the hood, along with a gas-electric hybrid that will arrive a little later in the product cycle. Mercedes will offer the pickup in a cdifferent versions; a commercial-oriented variant with a simpler cabin and more rugged trimmings, and a more luxurious version with all the comforts of Mercedes SUVs like the GLE-Class. Don't plan on seeing a "fat cowboy truck for North America," as Mercedes-Benz van chief Volker Mornhinweg put it to Britain's Car. The pickup is expected to be closer in packaging to the Volkswagen Amarok, rather than being a GLS-Class with a pickup bed. "We will enter this segment with our distinctive brand identity and all of the vehicle attributes that are typical of the brand with regard to safety, comfort, powertrains and value," Mercedes-Benz chief Dieter Zetsche said in a 2015 interview with Automotive News. The question of whether it will be offered in the States still hinges on Mercedes' ability to build it here. That's not in the cards at the moment. The Porsche office chair: Now in an RS model. As we’ve seen with a certain Top Gear host, Porsche has no shame in branching out beyond its four-wheeled ventures with clothing, fanny packs and, of course, office furniture. 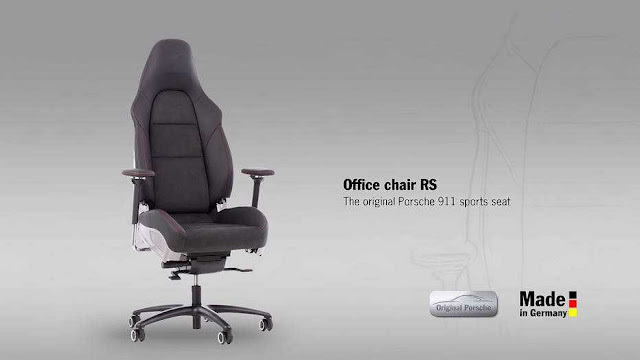 Porsche’s earlier office chair ranging at a pedestrian $5,690 before shipping. However, for those who insist on an upgrade, there is now an RS edition of the chair that tacks on nearly a grand more. Porsche isn’t promising any boost in productivity or comfort with its latest “masterpiece” offering, but it does say there are improvements over the previous model – continuous seat height adjustment, for example. Whether that's worth the $880 bump in price will depend upon the buyer. Price aside, the electronic adjustments built into the chair, facilitated by a rechargeable battery, are pretty slick. But where's the built in seat heater for those cold Michigan mornings? Granted, if you can afford the $6,570 sticker, you're probably not afraid to bump the thermostat up a few degrees either. Tesla swamped with 276,000 Model 3 orders in 3 days. The Model 3 is scheduled to start shipping in 18 months, though by the end of the first week Tesla may well have over 300,000 orders that it will struggle to fulfill. Musk says he expected 1/4 to 1/2 of that. "Elon Musk answers question on Twitter as $11.6 billion worth of orders pour in." 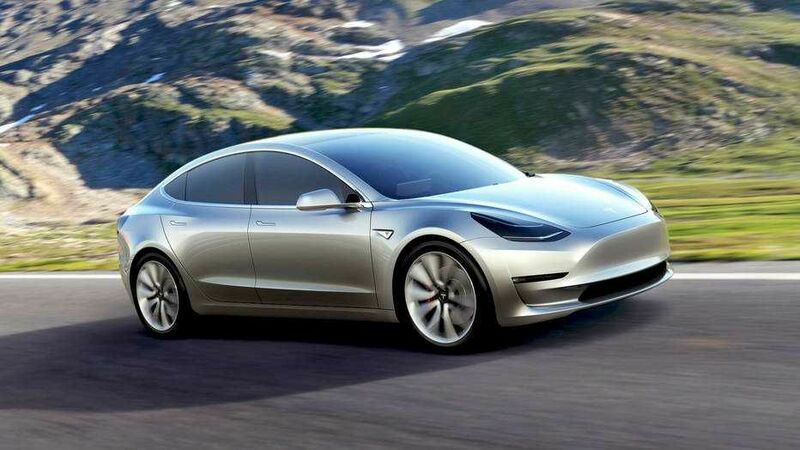 Tesla CEO Elon Musk admitted over the weekend the company had underestimated demand for the new Model 3 sedan: 276,000 orders were received by Saturday. Long lines formed outside Tesla store locations, with EV fans plopping down $1,000 to reserve Tesla's latest and most affordable model. "Model 3 orders at 180,000 in 24 hours. Selling price w avg option mix prob $42k, so ~$7.5B in a day. Future of electric cars looking bright!" - Musk tweeted at the end of the first day. By the end of the day on Saturday, the pre-order count reached 276,000. Based on Musk's estimate of a $42,000 average transaction price with a few popular options, the number of reservations roughly equate to an $11.6 billion backlog. Musk said he would give the full-week order count Wednesday, April 6. Musk himself seemed surprised by the pace of orders: "Thought maybe 20-30 people per store would line up, not 800," he tweeted. "Gifts on order." Over the busy weekend the CEO dropped a few more details about the upcoming sedan in an impromptu Twitter question and answer session. 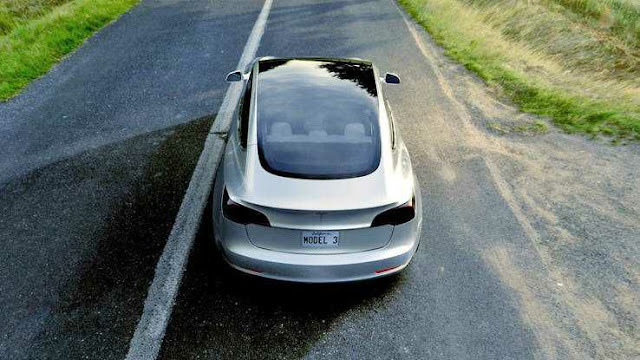 Musk indicated that the Model 3 will be rear-wheel drive, with a dual-motor all-wheel drive setup being optional. He also said that the sedan will fit two child seats in the back, and will also have a tow hitch as an option. When asked by a Twitter user why the company opted for a small trunk lid over a large rear hatch, Musk responded that the"only way to get enough rear passenger headroom was to move the rear roof cross-car support beam. A bike will still fit no problem." The Tesla CEO also indicated the company will need a factory in Europe in the long-term, once the Fremont, CA plant reaches maximum capacity. "Musk answered some questions from Twitter users over the weekend about the Model 3 and its design." Analysts have noted the company will likely need more than just the Fremont plant to fulfill the orders received so far, though Musk has not given specifics on future production. "Definitely going to need to rethink production planning..." Musk tweeted on the first day of orders. The CEO also promised "an extra gift for those who stood in some crazy long lines." Tesla is currently taking deposits of $1,000 for the new car, which will have a starting price of $35,000 before state and federal credits. This Month In Car History. "Until September 11, 2001, the Oklahoma City bombing was the worst terrorist attack to take place on U.S. soil." 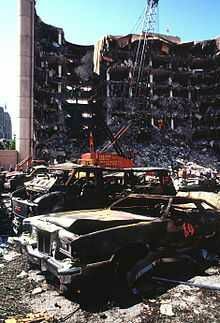 The Oklahoma City bombing was a domestic terrorist bomb attack on the Alfred P. Murrah Federal Building in downtown Oklahoma City on April 19, 1995. Carried out by Timothy McVeigh and Terry Nichols. 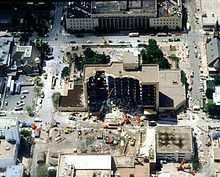 At 9:02 a.m., a Ryder rental truck loaded with a diesel-fuel-fertilizer bomb detonated in front of the nine-story Alfred P. Murrah Federal Building in downtown Oklahoma City. The powerful explosion blew off the building’s north wall. The blast destroyed or damaged 324 buildings within a-block radius, destroyed or burned 86 cars, and shattered glass in 258 nearby buildings, causing an estimated $652 million worth of damage. Extensive rescue efforts were undertaken by local, state, federal, and worldwide agencies in the wake of the bombing, and substantial donations were received from across the country. 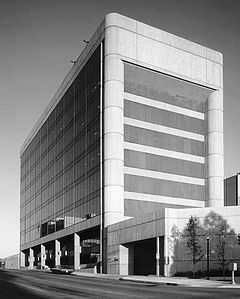 The Federal Emergency Management Agency(FEMA) activated eleven of its urban Search and Rescue Task Forces, consisting of 665 rescue workers who assisted in rescue and recovery operations, and when the rescue effort finally ended two weeks later the death toll stood at 168 people, including 19 young children who were in the building’s day care center at the time of the blast. More than 650 other people were injured in the bombing, which damaged or destroyed more than 300 buildings in the immediate area. McVeigh was executed by lethal injection on June 11, 2001, and Nichols was sentenced to life in prison in 2004. Michael and Lori Fortier who were accomplices testified against McVeigh and Nichols; Michael was sentenced to 12 years in prison for failing to warn the United States government, and Lori received immunity from prosecution in exchange for her testimony. In May 1995, the Murrah Building was demolished for safety reasons, and a national memorial and museum later opened at the site. 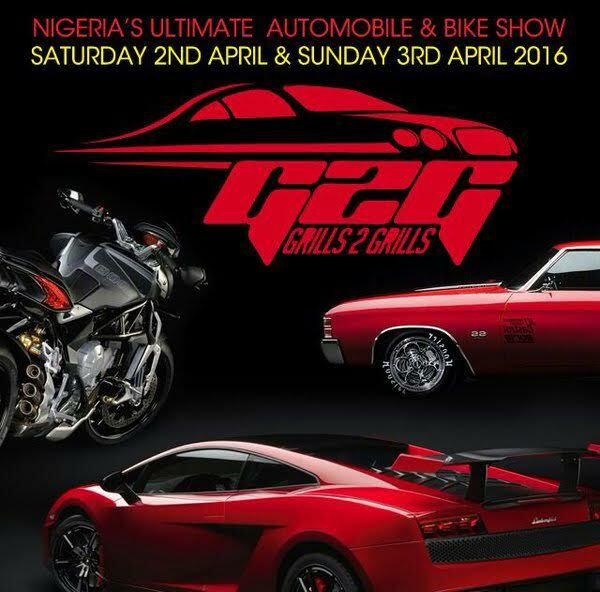 Nigeria’s ultimate automobile and bike show, Grills2Grills, is set to open this weekend, and it will be on for two days. The ultimate Nigerian exhibition of unique classic cars, super cars, muscle cars and motorbikes from private collectors and owners in Nigeria will hold at the Main Bowl of Tafawa Balewa Square, Lagos on the 2nd and 3rd of April, 2016 starting 10am on both days. The event will give guests close access to a large number of rare cars and bikes in a way they may not have experienced before. According to Dapo Otunla, founder of Grills2Grills, "the intention is to hold the event annually with the hope that Grills2Grills will become a landmark event that will bring people from across the globe to Lagos State, Nigeria. Away from celebrating new models and latest technologies in the automotive industry, the show will connect culture with automotive, while revealing classic cars, super cars, muscle cars and motorbikes which are iconic and extraordinary. A statement from the organizers said a regular ticket will go for N2,500; VIP tickets for N50,000; while tickets for kids will available for just N1,000.